Kim has made 2018 a year of diplomacy, personally meeting with the leaders of China, South Korea and the United States for the first times since taking the reins of his country in 2017. The joint letter follows the recent resumption of temporary reunions of relatives from the two Koreas separated by the 1950-53 Korean War and comes days after top South Korean security officials returned from a meeting with Kim in Pyongyang. 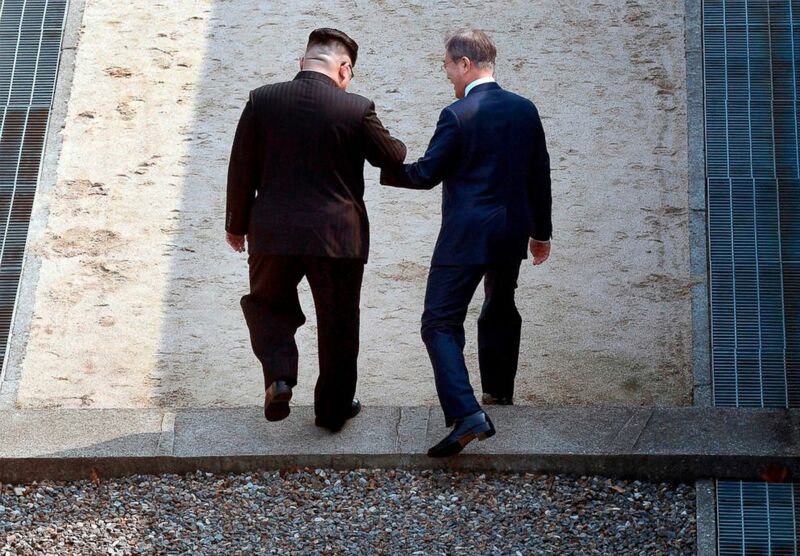 After the Korean peninsula was split by Cold War powers the US and the Soviet Union, the two halves went to war with communist China backing North Korea and the USA supporting South Korea. Trump, who said he expects Secretary of State Mike Pompeo to deliver the note, also brought up a statement from Kim on Thursday emphasizing his continuing "trust in Trump", despite difficulties in denuclearization negotiations. North Korean leader Kim Jung-Un attended but did not address the crowd. The absence of ICBMs at today's event will not come as a major surprise to analysts: previous satellite imagery of preparations for the event suggested proceedings would be comparatively low key. But in talks with special envoys of South Korean President Moon Jae-in on Wednesday in Pyongyang, Kim reiterated his commitment to attaining denuclearisation on the Korean Peninsula, Seoul said. United States officials have previously said they have already made conciliatory gestures, such as suspending joint military exercises with South Korea. He did not expect the North to do so, particularly as it would put the visiting Chinese delegation in the hard position of appearing to endorse the weapons programmes that have seen Pyongyang subjected to multiple global sanctions. On Saturday, Chung visited China to offer a similar briefing to Yang Jiechi, a member of the Political Bureau of the Communist Party of China Central Committee. Xi's decision not to go, but still send a senior envoy, may be calculated to show backing for Pyongyang while not antagonizing Trump as China and the USA are embroiled in a trade dispute. Kim "wants peace", Matvienko said. North Korea rolled out some of its latest tanks and marched its best-trained goose-stepping units through Kim Il Sung Square in a major military parade on Sunday to mark its 70th anniversary, but held back its most advanced missiles and devoted almost half of the event to civilian efforts to build the domestic economy. Chung said Kim showed "frustration over the doubt raised by some parts of the global community about his willingness to denuclearize, and asked us to convey his message to the United States".